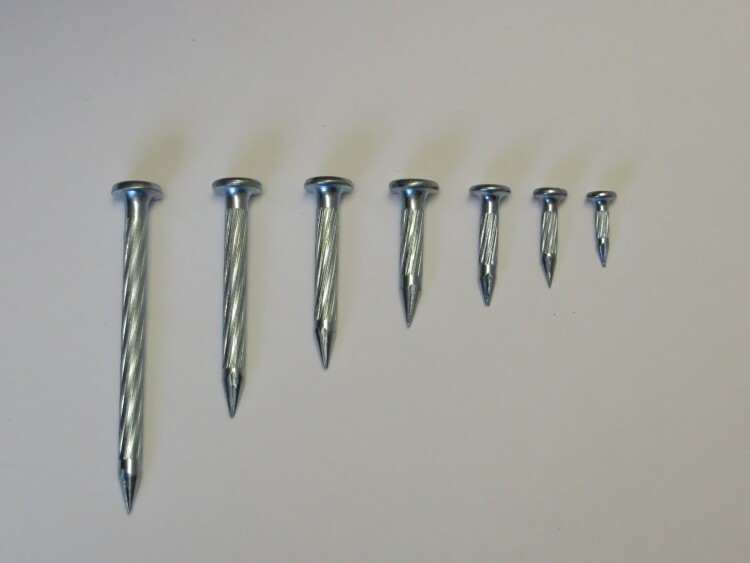 The MAG Nail ® has also been coated with an environmentally friendly zinc and clear chromate to resist corrosion. * For pre drilling into concrete use a masonry drill bit. 3/4" 1" 1 1/4" 1 1/2" 2" 2 1/2"
MAG Nail OUT PERFORMS ANY SURVEY NAIL PERIOD! MAG NAIL vs Parker Kalon (PK) nails. Pros:Stronger, more durable, higher quality, magnetic, and last longer. Cons:More costly than alternative methods of point setting. The Bottom Line: Use ChrisNik Mag nails for all your surveying construction and engineering needs, highly recommended over PK Nails. 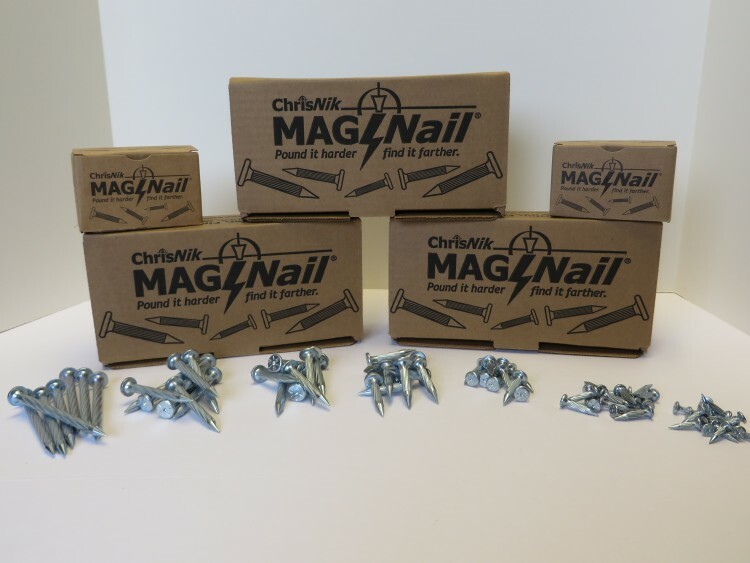 Mag nails, are used for land surveying and construction layout when critical points are needed to be set in asphalt, wood, or other such surfaces that a nail could be set into. Since most of the points we set end up in the real world, we have to be able to visually find them in the future. In addition the points set by one particular surveyor may need to be recovered by yet another. Pound it Harder, Find it Farther! Before mag nails was PK nails which are still available today. The creation of mag nails came from the need to find these set points by use of a locator or more commonly known by you and me as a metal detector. 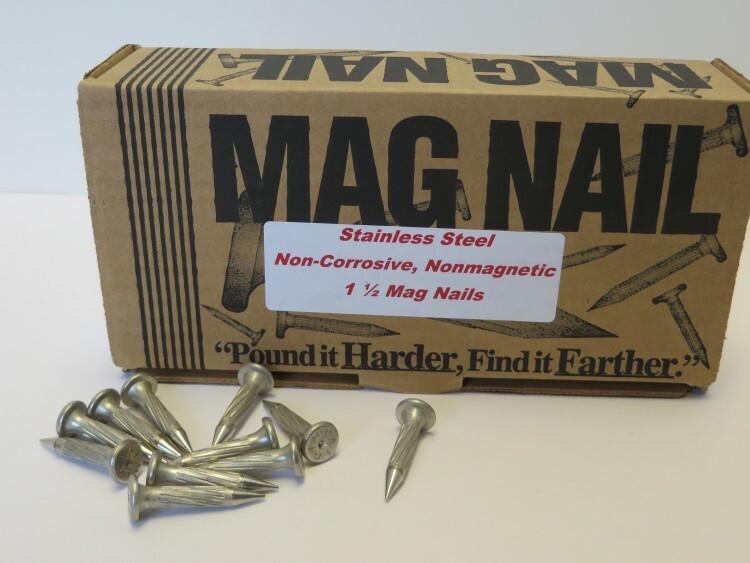 Since mag nails are magnetic, and larger in size than a PK they are found quicker and with greater ease using a locator. Furthermore Mag nails have a zinc coating to prevent corrosion and rusting longer than PK nails. This coating makes the nail shiny and more visible longer when set into different surfaces. However the most important improvement was the thickness of the striking head surface and the overall strength and durability of the nails; these nails are better able to withstand striking blows without the head coming off or the nail itself bending. So the slogan really means something, as the Mag's can be struck harder with a hammer, and found farther using a metal detector. There are many different tasks we use mag nails in the field of surveying and construction for. Most commonly used during a survey or for construction would be setting control. This can be achieved by using a robotic total station or a GPS/VRS unit. Typically you would set the point in location to your liking and occupy it with a GPS unit, or it could be shot in using a set instrument like a robotic gun. Once coordinates are set on the point you could move and occupy this as a known point. Since the Mag nails have a dimple or depression in the center of the nail's head it is very easy to occupy this using a survey rod and elevation can be check or set with a leveling rod in the future. Don't forget to ribbon up the nail and spray some paint around it so you can find it again! During construction many surveyors will set offsets to points because the original location or centerline of points will typically be where construction is taking place. Critical points include offsetting curb, manholes, underground pipes, building corners, and so on. If I was setting manholes in an existing pavement parking lot I would set a centerline of manhole point, then a 15' offset followed by a 25' offset in a straight line with painted instructions to the cut/fill for the manholes Rim and Invert elevations according to the engineering plans provided. This concept could potentially work for a situation involving proposed waterline underneath a road, where I would set nails online or where the waterline was purposed but also pull offsets so when the road was being dug up the contractor could use my offsets to reestablish the original center points. This is another example of a situation where mag nails may be used. Let us say a Farmers property goes to the centerline of a road near and it then follows said centerline until it reaches the corner of his lot. This would be an example where we could use mag nails to set points along the road to depict his property. Although mag nails may not be the most permanent type of boundary point, they are called out and accepted on surveys as such. Another common use for mag nails in the field of surveying would be setting cross ties to critical points and benchmarks for future purposes of construction. If you set a permanent monument in say the center of the road depicting a section corner or boundary, you could potentially set several cross ties to reestablish that point in the future using mag nails. A Benchmark is a vertical reference to elevation previously established for a survey using a level or possible GPS system. Most benchmarks like control are established for future reference concerning a construction project or topographic survey to be completed. Mag nails do a good job of establishing these points as they create a semi-permanent point of reference for the surveyor to use at his or her discretion. Once I had an opportunity to use and try out mag nails, I was pleasantly surprised. In the past we had only used PK nails as they were the only thing available. Thankfully ChrisNik Mag Nails came out and we purchased a few boxes, which quickly made our decision to switch to the mag nails an easy one. We noticed that the nails would indeed be found father away from the locator, and instead of being right on top of the nail we could sweep areas around it and still get a good sounding. In addition the nails ability to accept a stronger striking blow was immediately apparent as it did not bend as easily nor did the head snap off like so many PK nails I managed to deal with in the past. The sizes range from smaller nails to more custom size larger nails, the particular model I've been discussing and using for the purpose of this review is the 1 ½" x ¼" . We use the smaller nails as the costs are less between 20-25 bucks for a box of 100. I've seen mag nails usually 5 bucks more a box than PK's, but I believe you get what you pay for and the quality is well worth the extra money. In all honesty it can get pretty expensive if you are setting many of these points, for lets say a centerline of road every 50' for 2 miles. Elementary my dear reader, as by now you should know my recommendation is to never bother purchasing a PK nail, but move on to ChrisNik Mag Nails. As mentioned previously the price point is a bit extra but well worth the investment. I would personally recommend using them for all of your survey/construction needs especially in surfaces requiring nails. The coating does prevent the surface or head of the nail from corrosion much long than the PK nails, which makes it easier to find such a shiny object placed in a black asphalted surface. 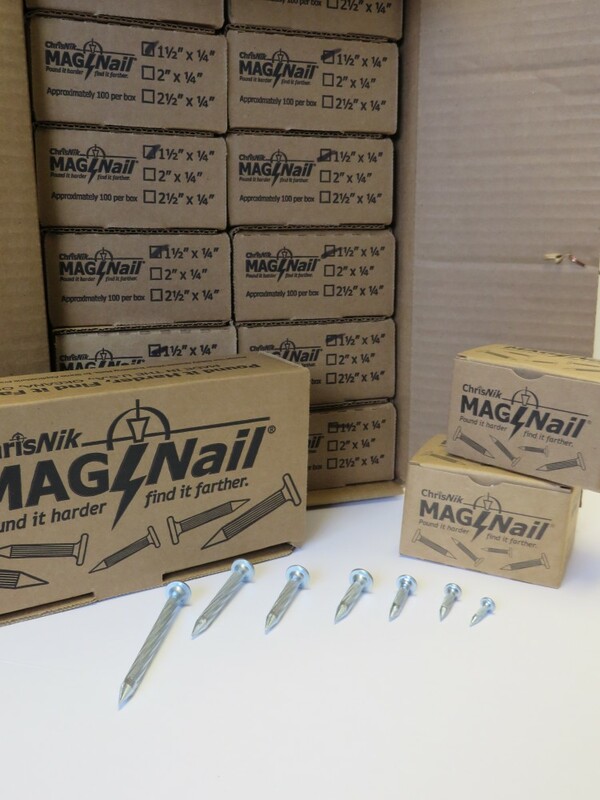 ChrisNik Mag Nails are pretty much the only thing we use know, we might have a few PK's floating around the truck somewhere but you won't find us at the survey store buying another box of them. 243500 3 1/2" x 1/4" 100 5 lbs. $28.24 NEW! ​251500SS Stainless Steel 100 4 lbs. $60.89 NEW! Ask your dealer about them today! ChrisNik's rock hard MAG Nail has become the choosen nail amoung surveyors worldwide. It out performs any survey nail, period! 3 1/2" 2 1/2" 2" 1 1/2" 1" 1 1/4" 3/4"